Polished aquamarine set in pure copper. 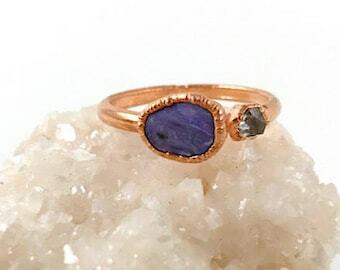 This ring is custom made in your size and will take 1-2 weeks to create prior to shipping. The ring will be sealed to preserve the finish. Stones vary in color (please see the pictures). If you'd like a specific stone please send a convo and I will show you what stones I have in stock! 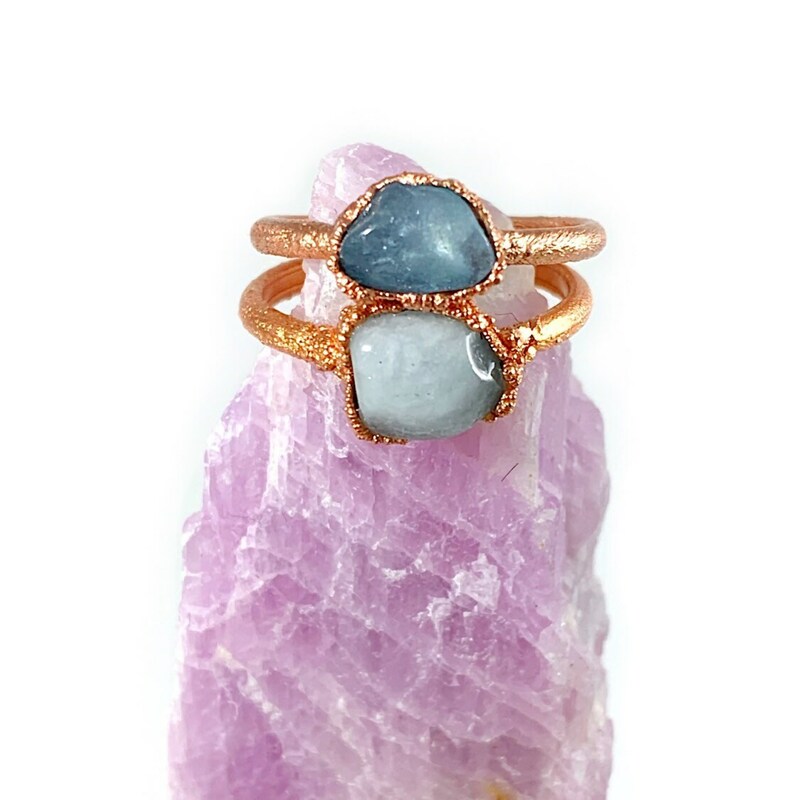 Note: This ring is made with a natural, aquamarine stone , which means there may be imperfections. It will be created through a process called electroforming, which allows copper to build up over several hours. It is unpredictable and results in one of a kind and unique pieces. However, there may be small nicks, pits and bubbles in the copper as it is a natural process. Additionally, please be aware that over time, the color of the copper will naturally begin to darken. Your copper jewelry may be cleaned using lemon juice or a vinegar/salt solution. Aquamarine is said to protect all who travel by, over or near water. It may bring feelings of peace, calmness and hope. It is also known as a stone of courage, and is believed to assist with reasoning and quick intellectual response. Beautiful ring! Very unique design and shipped quickly. My pieces came extremely fast for coming from the states to Canada. I’m very happy with my items, they appear to be made well. Seller was quick to respond to all my questions and great to work with. Definitely would recommend ! Payment is expected at time of purchase. All sales are final. Please be sure about the item before you submit your order. Many of the stones I use in my jewelry are raw and natural. Therefore, they may have imperfections. If you have a question about a stone, or need more pictures please ask! Many of my pieces are hung from chains that are plated gold or silver. I also sell earrings and bracelets that are plated in gold/silver. This means a thin layer of gold or silver is applied over a base metal such as iron, brass or copper. These are NOT real silver or gold pieces. Please keep in mind plated jewelry may eventually tarnish with repeated wear. Care recommendations: Avoid wearing while exercising, swimming, bathing, or sleeping. Chemical cleaners are not recommended for plated jewelry and may cause the plating to come off. Plated jewelry may react with different perfumes as well. If you are interested in another chain option such as gold fill or sterling silver please convo me for a custom order. I have a selection of chains in stock! Most of my rings and some of my earrings, cuffs and pendants are made with copper through a process called electroforming. This allows copper to build up over many hours. It is an unpredictable process and results in one of a kind and unique pieces. However, there may be small nicks, pits and bubbles in the copper as it is a natural process. Additionally, please be aware that over time, the color of the copper will naturally begin to darken. Your copper jewelry may be cleaned using lemon juice or a vinegar and salt solution. I am always available for questions and more than happy to send additional photos of an item upon request. Please don't be afraid to convo me for anything you may need! Thank you for understanding. Once payment is received, your order will ship within 3-5 business days, unless otherwise specified. I will ship your order via standard USPS (first class mail). If you would like to pay extra for insurance or expedited shipping please contact me. Please confirm your address is correct before submitting your final order. I am not responsible for lost or stolen items or items that do not get to you because of an incorrect address. Please double check that your shipping address is correct before submitting your order. In the event that your item needs to be sent back to me, you will be responsible for return shipping costs. I do my best to provide the best customer service possible. If you have any questions or concerns please contact me and I will be happy to assist you. Please contact me if there is an issue with your order before you leave negative feedback and I will do my very best to resolve it! The statements and information provided on my Etsy site about stones and crystals have not been approved by the Food and Drug Administration. The information is not an alternative to medical advice from your doctor or other professional healthcare providers. Additionally, stones and crystals should not be used as a replacement for medical treatment. The best way to obtain an accurate measurement is to go to a jewelry store. This just takes a few minutes and will ensure your ring will fit. We do not accept returns or exchanges, so please make sure you are ordering the correct size. Will your copper rings turn my skin green? Potentially. Copper does react with the chemicals in some people's skin and leave a green mark. This not an allergic reaction and it will not harm you. We seal all of our rings with a protective sealant, but rings experience a lot of wear and tear and the sealant does not last that long. You may put a coat of clear nail polish on the inside of your ring band to help prevent against greening of the finger. Is your jewelry gift wrapped? Yes! Your order will come ready for gift giving. We carefully package each piece in a hand-stamped box and tie it with colorful twine. To minimized packaging, we place multiple pieces of jewelry in the same box. If you need an additional box, please send us a message and we can accommodate you! 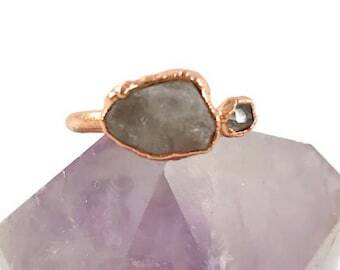 Is your jewelry made with natural gemstones and crystals? Yes. All of our gemstones and crystals are natural. Many of them are in their raw form and may have imperfections. If you ever would like an additional photo of a stone/piece of jewelry, please do not hesitate to ask.